Looking for original, creative yet refined and accessible jazz? 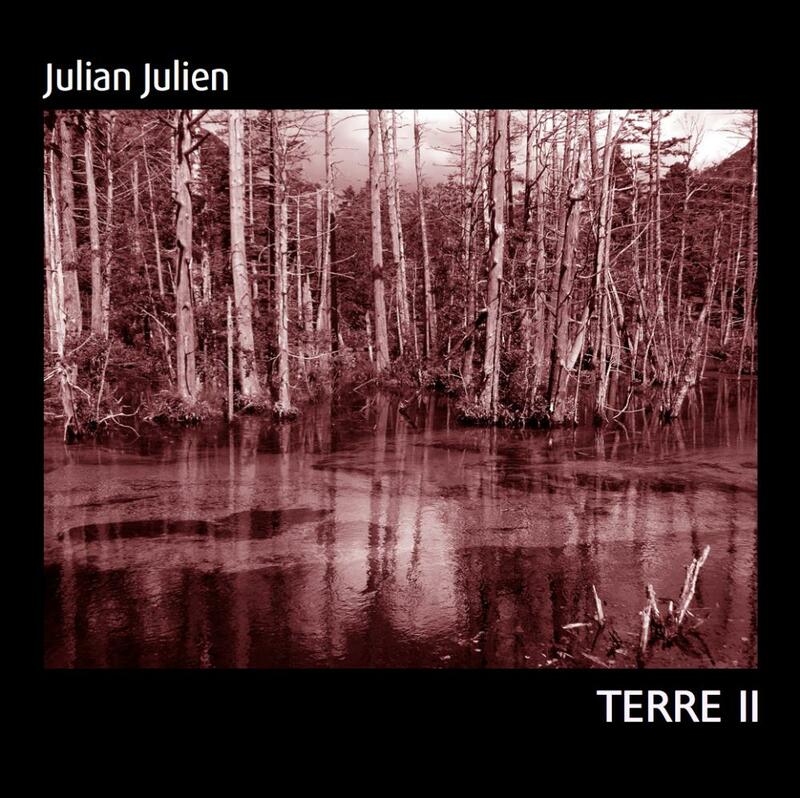 Classically trained composer JULIAN JULIEN's "Terre II" may well be your destination. Adopting a genuine cinematographic approach, this third self-produced album is composed of short soundtracks depicting professional photographs from all around the world. With a wide range of various influences, such as JOHN SURMAN, zheul, krautrock, ambient, Eastern, and even concrete music, these compositions are a true invitation to travel to different countries from Earth, but also to unknown worlds. The reference to photography is also perceptible with the tracks named "Iris" (Iris are adjustable diaphragms in optical capture devices). Thought as interludes by the artist, these short pieces are more atmospheric than the other compositions, and are interesting for their highly crafted sound work. This time, JULIAN JULIEN plays percussions instead of saxophone, as numerous guest musicians were invited to play on this opus. Mainly from the jazz universe, the palette of instruments used is quite large. However, the music do not resemble traditional jazz or fusion at all, but rather elegant, intriguing and sometimes enigmatic soundscapes. The opener "Prelude" immediately sets the tone. A true prelude for a journey to an unidentified destination. A beautiful mesmerizing overture, with a bit of JOHN SURMAN and a slight middle-eastern touch. The title track is more melancholic and hopeful, as its combination of piano and saxophone works perfectly. Sounding typically French at the beginning, the location is always evolving, you don't know where you are anymore. Paris? New-York? This mixture of different cultures is very nice. Then arrives the first ambient experimental "Iris", which surprisingly changes the atmosphere. As it title may suggest, "Ailleurs" ("Elsewhere" in English) does well carry its name. An aerial flute piece, with a mystical ambiance and crystalline sonoroties. With elements that can remind concrete music, early TANGERINE DREAM or KLAUS SCHULZE, the mysterious "Iris II" is spacey and floating, showing the artistic research on sound work. Nonetheless, the "Iris" tracks are not all short ambient pieces. The echoing horns of "Iris III" is a cry into the depths of the universe, like an astronaut seeking help from the infinite void. Quite cosmic, this is my favorite "Iris". On the contrary, as the only track with wordless vocals, I found the sad "Une attente" a bit lengthy. Back to spacey experimentations with "Iris IV" and its little dissonant trumpet. Maybe the only 'difficult' passage of the disc. "Doudou" possesses a genuine ethereal beauty. An unreal soundscape depicting several places from Earth. Magic! Concerning "Iris V", it combines exotica and ambient music in the vein of modern electronic bands such as AUTECHRE or PLAID. A little strange but still pleasant. The 8 minutes "Non-Sens" is the longest track of the record. With a style resembling JOHN SURMAN's, this melancholic composition is really good. The last "Iris" sounds like music made with glasses, displaying crystalline and enigmatic notes. The album concludes on a lighter tone with "Mr John Barry", showing also JULIAN JULIEN's inspiration from the cinema. This closer can be described as a jazzy and East-European "Peter Gunn", due to the presence of a cymbalum. A bit more conventional compared to the rest of the disc, but still pretty uncommon, refreshing and very cool. "Terre II" is a true journey around and beyond our planet. From his numerous travels and influences around the world, JULIAN JULIEN has really created a musical universe on his own, made of melancholic, mystical, touching and spacey soundscapes. Hard to describe, but not to listen to, this music is innovative and refreshing, yet varied and accessible. This is neither typical jazz/rock/fusion, nor complex free jazz here, but rather jazz instruments played for other purposes, refined and elegant ambiances, depicting Earth and space. Highly recommended! With the important sound work, JULIAN JULIEN's style is well suited to soundtracks. The artist already did some in the past, maybe he'll compose more and more soundtracks in the future, and maybe one day an artist will release a song named "Mr Julian Julien", who knows?